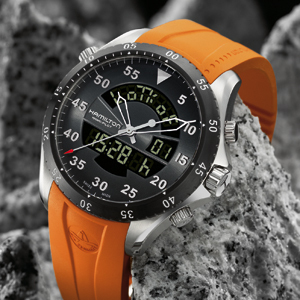 The Khaki Flight Timer, in collaboration with Air Zermatt, the prestigious Swiss helicopter rescue service, takes digital and analogue displays to new heights! This new multifunction pilot's watch incorporates a personalised logbook that records vital information for 20 flights and up to 99 landings for each. 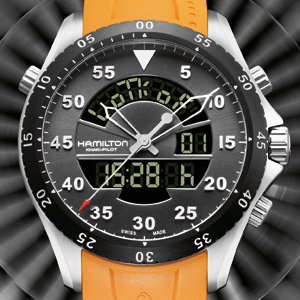 The crown and the pushers give pilots and thrill-seekers access to many useful functions, such as switching between the two digital time zones (SWAP), or synchronisation of the hands with the main digital time. 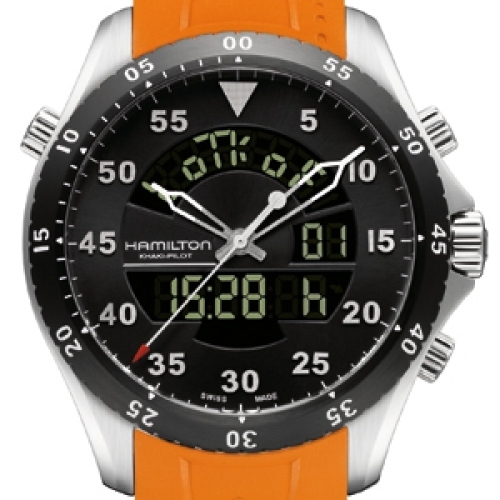 The launch marks the beginning of the official partnership between Hamilton and Air Zermatt, with a commemorative special edition that sports the rescue service's logo on the back of the case.